This is Part 8 of our Introduction to Lean Manufacturing Principles Series. Hang on friends, there really is quite a lot that Lean Manufacturing can do for Job Shops. This post is all about understanding how to apply it in Job Shops, what the most valuable components are for Job Shops, and how to get started. 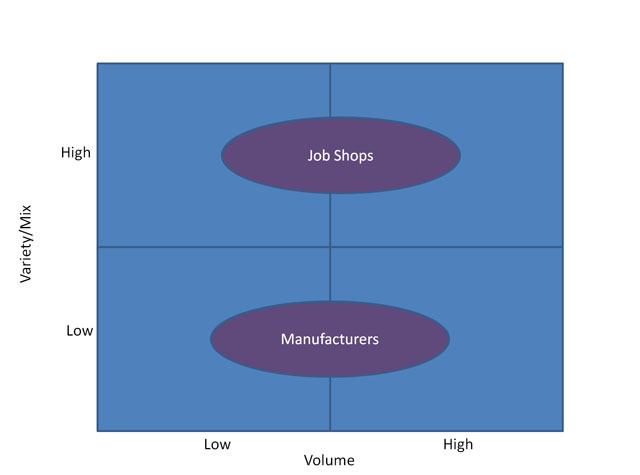 How Are Job Shops Different from Other Manufacturers? It’s really all about whether we’re emphasizing the Mix (making a wide variety of different parts) or the Volume (making the same part for long periods). If we make the same part long enough, we can really get that whole process dialed in and optimized. We can keep running Kaizen Events and coming up with new ideas to make our part with higher quality, faster, or more cheaply. But as a Job Shop, we’re dealing with such a wide variety of parts that change so often and are manufactured in relatively brief spurts that it is much harder. If we focus on optimizing some single part, we may be all done making it forever before we’ve been able to improve the process very much. To understand how to apply lean to Job Shops, I like to turn things upside down and ask what it is that Job Shops are really manufacturing? If we think of it as Job Shops trying to efficiently “manufacture” Jobs, we can gain some insights. What does it mean to efficiently “manufacture” Jobs? The one thing that happens a lot is that Job Shops switch to making something different. They switch to different Jobs. What if we focus our Lean Manufacturing techniques on getting better at switching to different Jobs? The switching is just one example of a process that endures across every different part that is worth considering for Lean Manufacturing. In fact, a Job in a Job Shop follows some particular workflow or process at a high level that can be optimized. We want to tease apart those things that are very part-specific set those aside, and focus on optimize the non-specific parts. How do we switch jobs? How do we do quotes? How do we schedule jobs and resources? And so on. If you can get your head around that little twist, it really helps when thinking about what things to apply Lean Manufacturing to and what things are not worth the investment. To put it another way, instead of optimizing a particular part optimize the process that is a Job in your Job Shop. Time Spent Finding Things: One Job Shop evaluated variability in job steps that they had thought should be pretty constant. The number one factor they discovered that accounted for the variability was time spent finding something needed–toolholders, gages, special cutters, and whatever else. It’s pretty easy to see that one of the benefits of a 5S Program is making things easier to find and more organized. Another outcome of the study (said study being very much like Kaizen) was the conclusion that they simply needed to buy more of some things so there would always be one available when it was needed. The time being wasted running around looking for things more than paid for keeping a few extras on hand. Focus on Setup Times: Lots of different jobs means lots of different setups. The Operator reads the Setup Sheet then has to go track down the right tooling, right fixturing, right g-code and all the rest for the Job. That all has to be installed on the machine before we’re ready to load the first piece of Rough Stock. Surely the task of Setup is happening often enough and has enough similarities that we can afford to focus our Lean Manufacturing efforts on it? Heck, Lean Manufacturing even has a specific principle aimed at reducing setup time called “SMED”. Have you ever run the wrong version of the g-code? Had the wrong tool in the carousel? Or done anything similar because you didn’t have the right information? 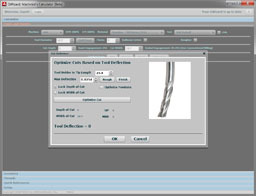 Managing the key information right alongside the Job is critical, which is why its also a focus of our G-Wizard ShopFloor software. In a world where so many shops are having a hard time hiring enough people with the skills they need, focusing on documentation, process, and learning on the job is crucial. Hence this is another focus for G-Wizard ShopFloor. – 5S and Organization can be very beneficial and are often a great way to start. – Kaizen and Continous Improvement make sense, so long as we focus on getting better at doing Jobs not specific parts. – SMED is all about reducing setup time and job changeover time and is a perfect candidate. 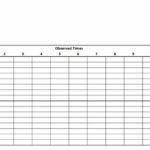 – Kanban might look at first like a lost cause for Job Shops, except as we pointed out in the Kanban article, it’s all about how you use the tool. 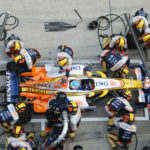 The article goes on to show how there are excellent opportunities to benefit from Kanban in every Job Shop. – Takt Time and Load Balancing concepts are unlikely to benefit Low Volume High Mix operations. Don’t dwell on them. 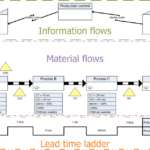 – Value Stream Mapping as a tool to analyze the part-independent Job Cycle may make sense, but truthfully, this is not going to be a protracted analysis. Part of the problem stems from the fact that the value streams in Job Shops are often highly chaotic as the same work cells are producing multiple parts at the same time and the value streams are changing around constantly with each new part that shows up. Applying any of these techniques to the vagaries of specific parts unless you’ve got a months-long contract to make a lot of them. A lot of it has to do with detail. For a big OEM Manufacturer dealing in High Volumes and Low Mixes, a lot of effort can be lavished on the details. They’re specified and standardized down to a very fine level of detail. For the Job Shop, the level of detail has to be backed off because below a certain level, every job differs in the details. There are exceptions in all of this. The main thing about Lean is that its a way of thinking about problems. Job Shops have different problems than Manufacturers, but we can still use most of the Lean Toolkit to make progress on those problems. The next installment of our Lean Manufacturing series looks at the Visual Factory and ways to reduce communication waste. This is definetly a great series. This particular post is the best of all. To be sure let’s go see. When we go to the shop floor we always find very few people actually adding value. Most are servicing waste. It is usually an eye-opener for everyone. I have been following your LEAN articles and can say the principles do apply to job shops. Searching for tools, fixtures and cutters can eat up a lot of time, it is also stressful and distracting. Getting organized requires a concerted effort plus time and some money. What I have been able to do, with regard to creating self contained work areas, has paid big dividends.